2017 Armed Forces Salute Offer Details Below! Disney honors America's servicemen and women with special resort and theme park ticket discounts. These discounts are exceptionally generous, and are the BEST available discount out there. Under the Armed Forces Salute, park hoppers are discounted approximately 50%. Resort room discounts are 30-40% discounted. Rooms are limited and subject to availability. Book these rooms early if you want to take advantage of these amazing rates! In addition to the Armed Forces Salute, military discounted tickets may be purchased at your local military base ticket office. Shades of Green, on Disney property, is an exclusive resort owned by the U.S. Government, that provides spacious accommodations for active and retired military members at rates commesurate with rank. In addition, there is a ticket office at Shades of Green that carries a wide variety of theme park and local attraction tickets at discounted rates. Military personnel (including active duty personnel and dependants, retired military, reserve and national guard, foreign visiting military and Department of Defense employees) are eligible to purchase park passes at discounted prices. Military Discount tickets can be purchased at either your local base MWR/ITT office or at Shades of Green Resort on Walt Disney World property. If you are staying at Shades of Green or another WDW Resort Hotel, you may purchase the Stars and Stripes Magic Your Way Passes. Click HERE to visit the price list provided by Shades of Green. If you are not staying at Shades of Green or another Walt Disney World Resort, you may purchase discounted Magic Your Way tickets. These are the same prices you willl see at your local base ticket office. Click HERE for the current price list. Please note: you do not need to be a registered guest to purchase tickets at Shades of Green, but you do need a valid Military I.D. card to enter the resort and purchase tickets. Disney's Armed Forces Salute is a special ticket offer available to military members and their families. These 4 Day Tickets are offered at a substantial discount. Information for these tickets can be found below. Please note, these tickets have restrictions. service member or their current spouse (but not both) can purchase tickets. No more than SIX (6) tickets may be purchased and activated by the Eligible Service Member or spouse (but not both) regardless of the place of purchase and whether purchased by that person or that person's spouse during the promotional period. In addition, one of the SIX tickets must be used by the Eligible Service Member or his/her spouse. Each ticket must be used by the same person on any and all days. Allows the guests the freedom to visit one park or multiple parks on the same day to the Magic Kingdom® Park, Epcot®, Disney's Hollywood Studios®, Disney's Animal Kingdom® Theme Park. must start before 4 pm. General admission to ESPN Wide World of Sports Complex. To book this offer, you must be an active or retired member of the U.S. Military, including the National Guard, Reservists and the U.S. Coast Guard. Effective as of January 3, 2016, active or retired members of the Commissioned Corps of the Public Health Service (PHS) and the Commissioned Corps of the National Oceanic and Atmospheric Administration (NOAA) are also eligible for this offer. Spouses of Military Service Members and PHS and NOAA Commissioned Corps members also qualify if they are able to present valid and active U.S. Military IDs in the absence of the Military Personnel or Commissioned Corps members. Most nights from January 3 through December 19, 2016, offer not valid March 20, 2016 through April 1, 2016. Additional per-adult charges may apply if there are more than two adults per room. Qualified individuals (see above) may book up to a maximum of 3* rooms at Walt Disney World Resort and 2* rooms at the Disneyland Resort at a time during the period of the Disney Armed Forces Salute. All rooms must be in the same resort and check in on the same day. 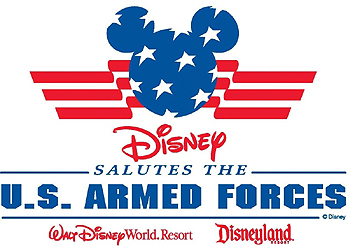 Disney's Armed Forces Salute is a special ticket offer available to military members and their families. These 4 and 5 Day Tickets are offered at a substantial discount. Information for these tickets can be found below. Please note, these tickets have restrictions. The Armed Forces Salute Ticket is available to the following US military members: "Eligible Service Members" are active or retired members of the U.S. Military, including the National Guard, Reservists and the U.S. Coast Guard, the Commissioned Corps of the Public Health Service (PHS), and the Commissioned Corps of the National Oceanic and Atmospheric Administration (NOAA). Spouses of Military Service Members also qualify if they are able to present valid and active U.S. Military IDs in the absence of Military Personnel. 100% Disabled Veterans with a valid military identification card (DD Form 1173). Veterans Affair (VA) cards are not accepted as proof of eligibility. The eligible service member or their current spouse (but not both) can purchase tickets. Most nights from January 1 through April 8, 2017. Offer not valid April 9-23, 2017.